I have tried doing a pumpkin lesson with my 2nd graders for a while now.. but nothing ever really stuck. UNTIL NOW! Ladies and gentlemen.. let me be the first to tell you how much I vehemently HATE chalk pastel. It make a giant mess, I have to constantly be on kids about not blowing the chalk dust into the air, and everyone's clothes somehow get covered in it EVERY. TIME. With that being said.. it does the most beautiful things. The way colors can be blended together is breathtaking and every child leaves feeling like an artist. How can I say no to that? 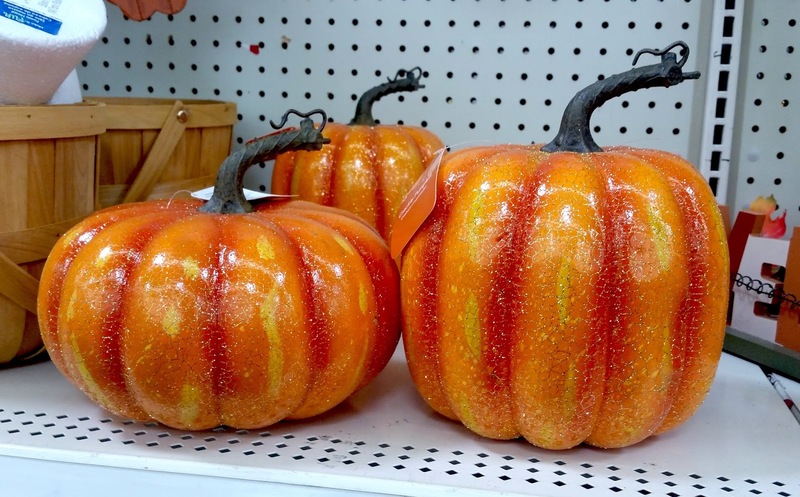 So to begin this lesson we started by examining a fake pumpkin I bought from Wal-Mart. I asked my students what they noticed about it and they mentioned that it was covered in glitter, had different kinds of orange on it, and it had a lot of lines. I held the pumpkin up to a color mixing poster I have hanging up in my room and pointed out that the majority of the pumpkin was orange.. but it also had a few yellow-orange and red-orange spots. Then I addressed the lines on it. We talked about how the lines were straight vertical lines.. but when they were placed around a sphere-like object.. they looked curved. 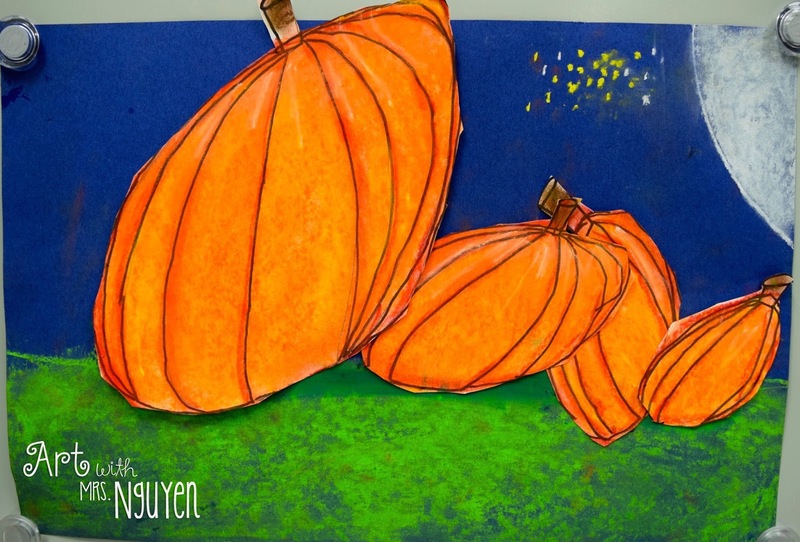 Then it came time to draw! I asked students to start by making at least 3 circles on their page (one large, one medium, and one small). 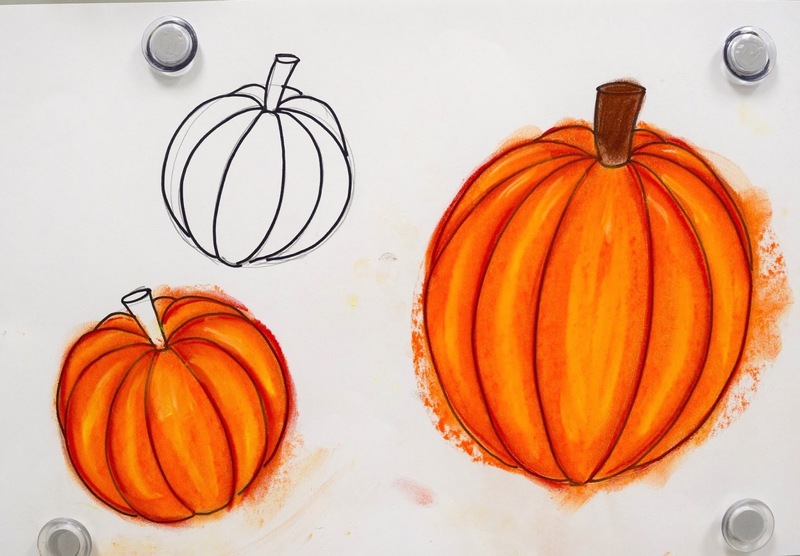 Then I demoed step-by-step how to draw the rest of the pumpkin. 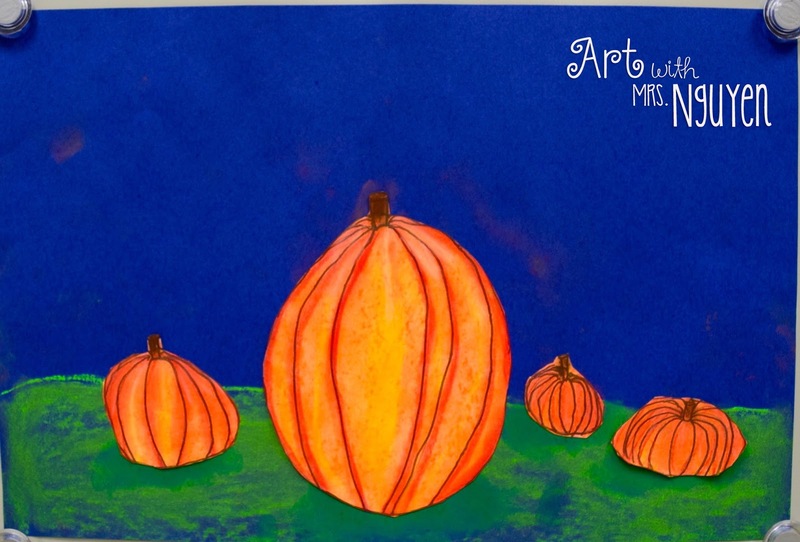 Once their drawings were completed, students outlined their work with a sharpie marker. The next day they came in was chalk pastel day! I'm sure as my students walked in they saw a look of horror on my face.. they KNOW how much I love/hate chalk pastels. Nevertheless we got down to business. Before we took the pastels out I gave each student a wet paper towel. The paper towels are meant to help students keep their cool (and mine) during the entire process. I cannot tell you the number of times my students got up and asked if they could wash their hands ("No because you are still using them!"). So they use the paper towel to wipe their finger and/or table spot. I went step-by-step with my students through all of the chalk pastel directions by demoing on my document camera. 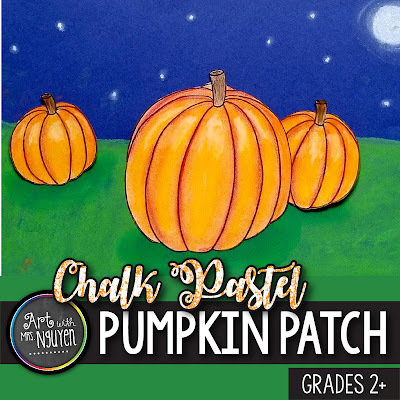 First we laid the orange chalk pastel on its side and quickly rubbed it over the pumpkin area.. then students used ONE finger (hahahahahaha yeah right) to rub the pastel into the paper. Next I showed them how to apply the yellow chalk pastel to the center part of each of the pumpkins sections.. then lightly blend it in. Then they used a red pastel to lightly outline all of their pumpkins sharpie lines (sans the stump).. then use one finger to trace over those red lines to blend them in. 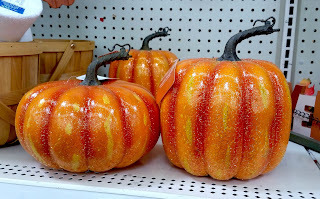 Then they used a white pastel to add a couple highlights to the top of their pumpkin and brown or green for the stump. Then we spent like 10-15 minutes washing our hands and cleaning up the tables. All while I debate in my head why I'm even teaching this lesson to begin with. On the last day I had my students come in and sit on the carpet. 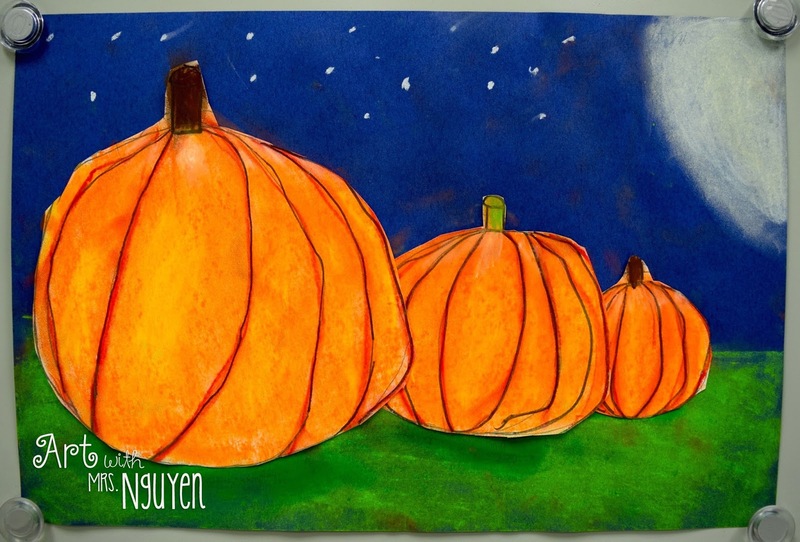 We looked at two similar pictures of pumpkins and compared and contrasted them. Which one looked more realistic? Why? What did the artist do in one picture that was different from the other? I think putting the two images next to each other really helps students to see the differences. We eventually get to talking about shadows, size, positioning, and overlapping as ways to create the illusion of depth (which they continue to pronounce "death" - even though we've practiced several times at this point). Then my students went back to their seats while I passed out 12"x18" dark blue construction paper. I had them write their name on their blue paper first and then set it aside as they cut their pumpkins out from their paper. Once most of my class was done cutting, I showed them how to use the side of a lime green chalk pastel and their ONE finger to create the ground on their paper. I instructed them to make their horizon line almost halfway up their paper so they'd have plenty of space to arrange the pumpkins in their picture. 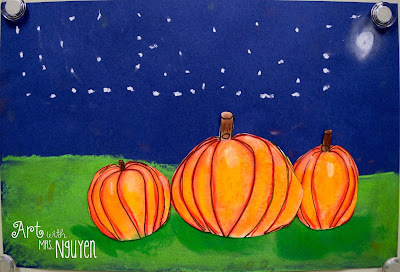 Once they finished the ground, I had them lay their cut out pumpkins on their paper and arrange them how they'd like (preferably using some of the techniques we just talked about). 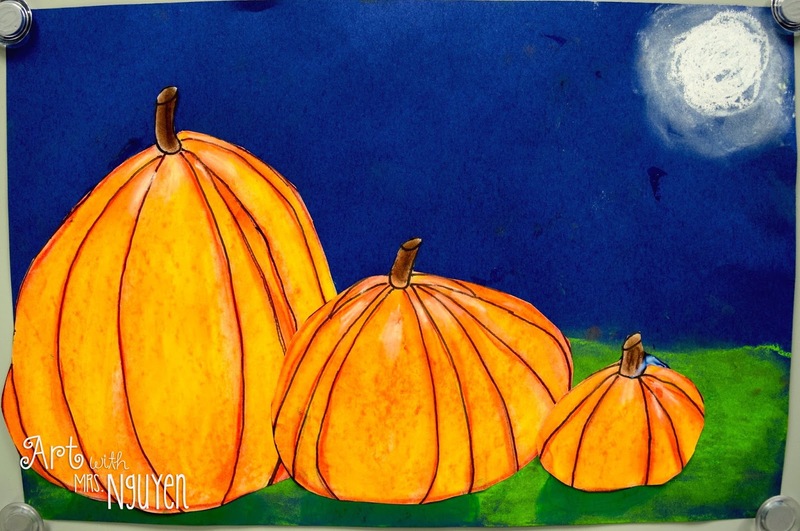 Once they were happy with the placement I showed them how to create shadows for their pumpkins. 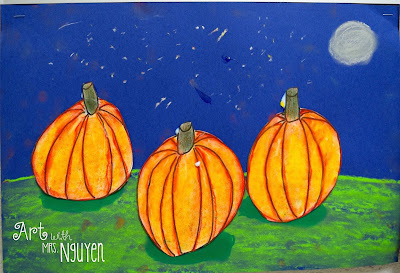 First they lifted up a pumpkin on the page (furthest back first) and color a dark green oval on their page. 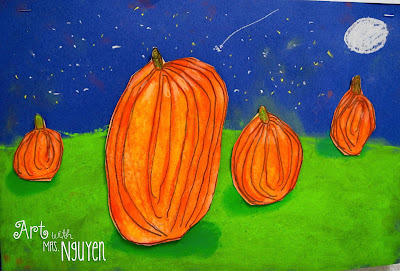 Next they used ONE finger to rub the dark green into the lime green, then glued their pumpkin into the dark green space. 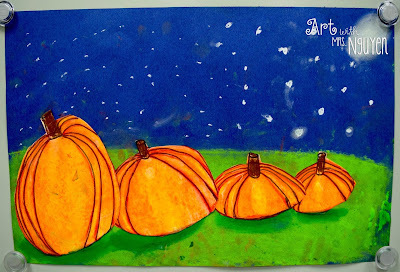 The last step of the project was to use a chalk pastel to create a moon and stars if they wanted to (or had time to). I'd say that the results speak for themselves. As much as I can't stand chalk pastel... I couldn't imagine not allowing my students to create such a beautiful piece. For a more complete lesson breakdown with the PowerPoint I used, step-by-step handouts, instructional videos, and teacher procedures - check out this lesson in my store! Thank you for this! 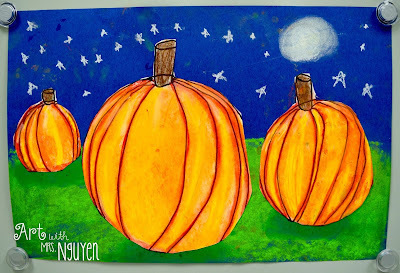 I was looking for a fun pumpkin pastel project to do with our homeschool co-op tomorrow and this looks great! I just made a sample and it definitely has the wow-factor. I know the kids will be so proud of what they create. Thanks again for the great post! did you spray it with fixative? Did students rub their hands over these while they were hanging in the hall? They are BEAUTIFUL!!!!! !